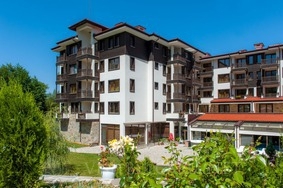 Location: St. George Ski and Holiday is located in the older part of Bansko where luxurious modern hotels meet with the ancient Roman baths and mediaeval churches. The hotel is conveniently close to the gondola ski lift which ferry skiers and snowboarders to world class ski conditions on the peaks of Pirin Mountain from December to May. From St. George Ski and Holiday it is only a short stroll to a wide variety of entertainments including shopping centers, ice rinks, restaurants and night clubs. Accommodation: St. George Ski and Holiday is a fabulous hotel of luxury apartments, which combines ancient history and modern splendour. St. George Ski & Holiday offers a four star luxury and lifestyle that will satisfy the desires of the most refined guests. St George Ski & Holiday offers you to enjoy outdoor activity and luxurious facilities, to be in the heart of the vibrant town of Bansko and yet to feel the closeness of the unforgettable mountain nature. St. George’s Location, Facilities, SPA and Architectural design combined with the supreme quality of hotel services. Spa & Gym: Escape for a moment to a place where times moves slowly, where nature surrounds you and where pure spa services using the best natural and modern technology are on offer. Restaurant: Guests can start their day with a freshly brewed cup of tea or coffee in the exquisite two-level lobby bar and in the evening enjoy an elegant dinner in the stylish French or Mediterranean restaurants, finishing off with a drink in the bar.